With more than half of Americans not investing in the stock market at all, it is little wonder that investment needs a revolution. People have a lot of reasons for not investing. Some people don’t understand what investment entails, other than a few basic concepts. Others understand the general idea, but they don’t know how you start. Still others know how to buy stocks, bonds, funds, ETFs, and the like, but they just don’t get around to it. A last group starts feeling intimidated when you bring up investment, either that they could never understand the concept or that they certainly don’t have enough money to take part. This last part isn’t true unless you decide that it’s true. There is a form of investment that works for everyone, simple to understand and easy to organize, at least with help. But it’s good investment help that has long been difficult for people to find. There aren’t many charitable organizations out there knocking on doors to create new investors. So the investor pond was stocked with individuals with a certain amount of drive and ambition. Those who did not invest could have done very well, but never got in the water for one reason or another. Betterment is an example of a company that started to change all of this. You’re already familiar with Betterment if you’ve been a reader of this blog for very long at all. Betterment makes it incredibly easy to start investing. Simply by communicating your goals to their innovative platform, all of the heavy lifting is done for you. Investments are made with your monthly or periodic contributions to a selection of ETFs that is in keeping with your personal financial goals. But until now, these goals were left pretty generic. Basically, you just typed in how much money you thought you needed, and Betterment let you know how much you needed to contribute, in various market climates, to get you there. It was a good system, but terribly general. But now, Betterment is unleashing new products that help users understand their investment trajectory a lot better. RetireGuide is a new financial tool Betterment is rolling out to make sure that you are taking every bit of your financial life into account when planning for retirement. Where do you want to retire? Do you have other investment accounts that exist outside of Betterment? How much does your spouse or partner make? How much do you expect to draw from Social Security, and will it exist at all when you need it? All these are very relevant questions, obviously, but now Betterment takes them into account. Betterment is also making TLH+ available to all users, not just those with the highest net worth. In this way they are committing to make Betterment a more and more sophisticated investment tool for every user. In the end, Betterment should be the most nuanced and powerful investment approach for the new investor, regardless or means or current wealth. For those who are unfamiliar with investment, it may be the best possible place to start. But it’s not just a launchpad. 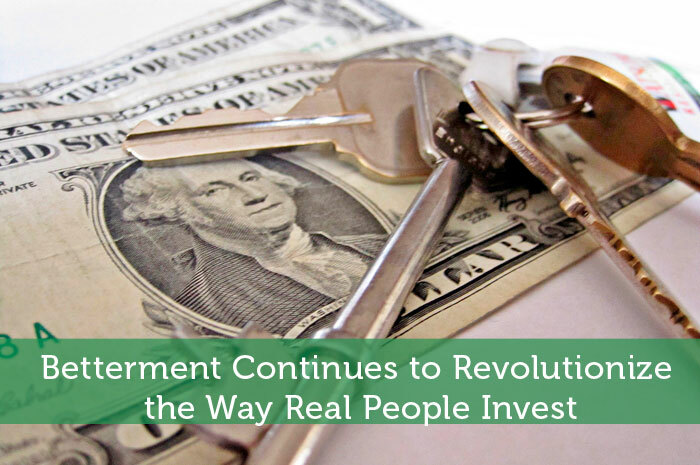 Betterment can be your investment home for years or decades to come. How much are the fees? Betterment sounds like an awesome tool for college graduates to start investing. But, if the fees are high I would rather just stick with Vanguard funds. I’m going to check Betterment out this weekend. Some of us still not realize the potentials of having a better life when we invest. And, Betterment is one good option or way to start with it. Nice review on Betterment!